Spring, 1970 I heard it the first time. It jumped from the car radio like a revelation: B. B.’s solo that kicks off “The Thrill Is Gone”. Man, that thing told the unvarnished truth without wasting a note. I bought the 45 that day. I played it till my stereo needle destroyed the grooves. The tune matched my mood. The girl I loved had broke my heart. I didn’t learn the song then, though. All the bands I was playing in did pretty much top forty. Playing something that soulful was unimaginable to me, I guess. The first night I played with Aron, I picked up the progression to “The Thrill Is Gone.” Next day I bought B. B. King’s Greatest Hits and started copping all the licks I could from the song and from the rest of the album. 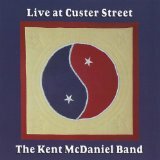 Around twenty years later “The Thrill Is Gone” ended up on a live CD we recorded in Evanston at Custer Street Fair, cleverly entitled Live At Custer Street. We were having a pretty good day, and I like how the song came out. Clicking on the I icon below will play our take on the tune.